The spread of retroviruses between cells is estimated to be 23 orders of magnitude more efficient when cells can physically interact with each other1, 2. The underlying mechanism is largely unknown, but transfer is believed to occur through large-surface interfaces, called virological or infectious synapses3, 4, 5, 6. Here, we report the direct visualization of cell-to-cell transmission of retroviruses in living cells. Our results reveal a mechanism of virus transport from infected to non-infected cells, involving thin filopodial bridges. These filopodia originate from non-infected cells and interact, through their tips, with infected cells. A strong association of the viral envelope glycoprotein (Env) in an infected cell with the receptor molecules in a target cell generates a stable bridge. Viruses then move along the outer surface of the filopodial bridge toward the target cell. Our data suggest that retroviruses spread by exploiting an inherent ability of filopodia to transport ligands from cell to cell. Are filopodial bridges different from lipid rafts ? When murine leukemia virus (MuLV) Env proteins associate with lipid rafts does this transfer happen in the blood ? Palmitoylation of the murine leukemia virus envelope protein is critical for lipid raft association and surface expression. Li M, Yang C, Tong S, Weidmann A, Compans RW. Department of Microbiology and Immunology and Emory Vaccine Center, Emory University School of Medicine, Atlanta, Georgia 30322, USA. To investigate the association of the murine leukemia virus (MuLV) Env protein with lipid rafts, we compared wild-type and palmitoylation-deficient mutant Env proteins by using extraction with the mild detergent Triton X-100 (TX-100) followed by a sucrose gradient flotation assay. We found that the wild-type MuLV Env protein was resistant to ice-cold TX-100 treatment and floated to the top of the gradients. In contrast, we observed that the palmitoylation-deficient mutant Env protein was mostly soluble when extracted by ice-cold TX-100 and stayed at the bottom of the gradients. Both the wild-type and mutant Env proteins were found to be soluble when treated with methyl-beta-cyclodextrin before extraction with ice-cold TX-100 or when treated with ice-cold octyl-beta-glucoside instead of TX-100. These results indicate that the MuLV Env protein is associated with lipid rafts and that palmitoylation of the Env protein is critical for lipid raft association. Although the palmitoylation-deficient Env mutant was synthesized at a level similar to that of the wild-type Env, it was found to be expressed at reduced levels on the cell surface. We observed syncytium formation activity with both the wild-type and mutant Env proteins, indicating that palmitoylation or raft association is not required for MuLV viral fusion activity. Proc Natl Acad Sci U S A. 1995 Oct 10;92(21):9871-5. You're unearthing some pretty scary stuff! I'm beginning to think of you as the Stephen King of XMRV! I know I don't understand molecular biology beyond the basics, but I don't see how the description of filopodial bridges in the abstract equates to the conclusion Gerwyn draws here about XMRV. If cells infected with retroviruses connect to uninfected cells, and this facilitates transmission of the infection, wouldn't that occur between blood cells? Why would XMRV be slowed down by entering blood cells? And how does the paper support the conclusion that XMRV does not need to enter blood cells to spread throughout the body? Can someone help me connect the dots? Blood cells are not in contact with each other Jenny. The retrovirus spreads from the infected cell to an uninfected neighbouring cell by means of the filopodian bridges two and a half times faster than any other method without any need to enter the bloodstream.It is a well known method for retroviral transfer.It is sometimes called cell-cell transfer. 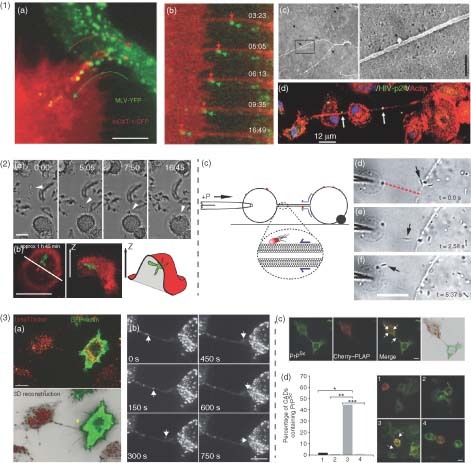 gap junctions and synapses, for cell–cell communication. Gerwyn, how's that PhD coming? Still confused. Cell-to-cell transfer is different from a virus spitting out its particles into the bloodstream, with the particles wandering around and infecting new cells, right? So I get that the retrovirus is not "in" the blood in the same way viral particles would be. But cell-to-cell transfer can occur within the bloodstream, can't it? For example, the article that natasa778 linked showed cell-to-cell infection with HIV in T-cells in plasma (spun out from whole blood). So when you say that XMRV does not need to enter the bloodstream, are you saying that it does not follow cell-to-cell transfer among lymphocytes in the bloodstream? Or that it is not spitting out particles into the bloodstream? natasa778, I did look at the pictures and article you posted. I confess the pictures were confusing to me. I did find this video of HIV cell-to-cell transfer that's very interesting. I'm still struggling to understand what Gerwyn means by "XMRV does not need to enter the blood" because it appears to me that cell-to-cell transfer can occur between lymphocytes in the bloodstream. Maybe I'm missing something . . . I'm still struggling to understand what Gerwyn means by "XMRV does not need to enter the blood"
Cholesterol-rich microdomains like lipid rafts were recently identified as regions within the plasma membrane, which play an important role in the assembly and budding of different viruses, e.g., measles virus and human immunodeficiency virus. For these viruses association of newly synthesized viral proteins with lipid rafts has been shown. Here we provide evidence for the association of the envelope protein (Env) of the 4070A isolate of amphotropic murine leukaemia virus (A-MLV) with lipid rafts. Using density gradient centrifugation and immunocytochemical analyses, we show that Env co-localizes with cholesterol, ganglioside GM1 and caveolin-1 in these specific regions of the plasma membrane. These results show that a large amount of A-MLV Env is associated with lipid rafts and suggest that cholesterol-rich microdomains are used as portals for the exit of A-MLV. I think I've got it! Thanks! Keep us up to date on what you find out about this one. Which can potentially explain why blood tests are so difficult to do successfully. I get that red blood cells aren't likely to build bridges - they are essentially preprogrammed dying cells, with limited life expenctancy and must be contstantly replaced. Do you know if this is true of immune cells in the blood? Some types of immune cells deliberately communicate with each other in close contact, but I have not followed up on any specific mechanisms. You state that the contact has to be constant, this might imply that transfer between immune cells might only occur in the lymph nodes, since in the blood these cells are frequently too active. Does anyone have any thoughts on this?